MUMM-RA summons the DRILLER to destroy the Cats’ Lair by drilling a tunnel from the Acid Lake to the Lair’s foundations. The Sword of Omens shows LION-O the source of the danger and TYGRA, having analyzed the acid, concludes that the alkaline Sponge Fog can only neutralize it. Using the ThunderTank, the THUNDERCATS cut out a section of the Sponge Fog and take it back to the Lair to wedge it beneath the foundations, in the path of the acid. The journey is dangerous and the THUNDERCATS are forced to fight off ROCKMEN, a MECHANOSECT, and a GIANT BEETLE. When the Thundertank’s transmission fails and LION-O investigates, he is almost crushed by a GIANT WORM. Summoned by the Sword, the THUNDERCATS save him. MUMM-RA, who has witnessed their entire journey, severs the Bridge of Light and causes the ThunderTank to plunge into the River of Despair, where it turns upside down and loses the precious section of the Sponge Fog. LION-O retrieves the Tank and the Sponge and the THUNDERCATS pack the Sponge into the Lair’s foundations, saving their home and defeating MUMM-RA. Sometimes our daily lives are disrupted by something happening to us out of the ordinary or by a crisis. 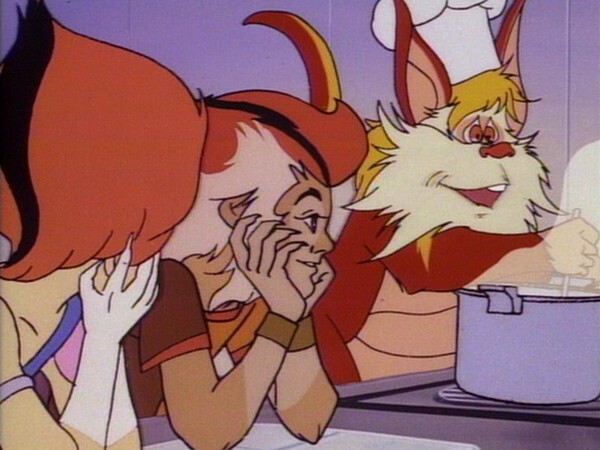 In this episode, the ThunderCats had to respond to a crisis caused by an outside force of the seeping Acid, which threatened their home. Their reaction was a quick acknowledgment that action was needed and the development of a resourceful response. As a result, they succeeded in coping with the problem. Had they waited or reacted slowly or even ignored the signals of the crisis, it would have only worsened and caused a catastrophic loss for them. When we are faced with a problem and react slowly or passively by withdrawing or wishing it would go away, we risk making it worse. Problems demand action and an active responsibility on our part to put forth effort to solve them. Upon their arrival on Third Earth, one of the first things that the ThunderCats did was to build Cats’ Lair, their base of operations. Over the course of the series, Cats’ Lair serves as both a base, a stronghold, and even, it could be argued, something of a sanctuary—the one piece of their adopted home planet that is still, truly, their own. As such, any scheme by one of their enemies to take this sanctuary away from them would, on paper at least, prove to be one of the most effective strategies against the ThunderCats. That is the basic concept behind “Return of the Driller”, the second of writer Howard Post’s two ThunderCats scripts, and it’s fair to say that this episode yields mixed results. Because of the episode’s title, obviously the first thing to focus on is the character of the Driller himself, and his role in this episode. 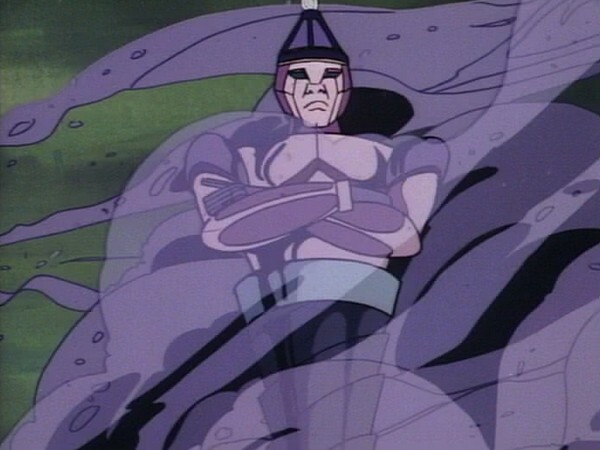 A fan favorite for many ThunderCats viewers, the Driller is an intriguing character—a subterranean agent of Mumm-Ra, the Driller’s voice, generally featureless expression, and cold, seemingly remorseless personality are accentuated by the sense of mystery surrounding him. 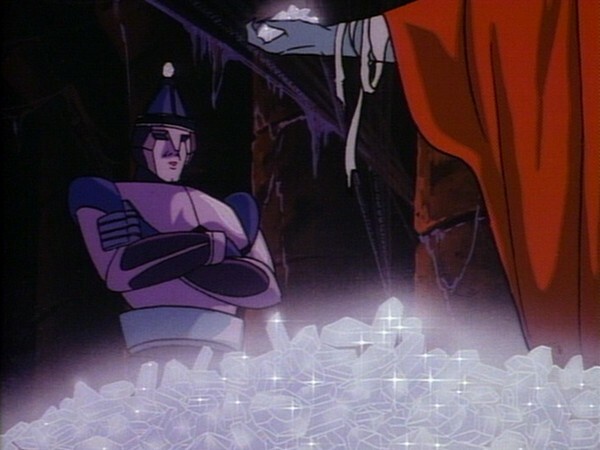 A villain without an origin, the Driller makes a commanding on-screen presence, and this is very true of this episode, where we are once again shown the influence that Mumm-Ra commands over the Driller by his possession of the diamonds that the villain needs to hone his drill point, lest he become trapped within the earth forever. Although probably not intentional, this actually works as a parable for a character who is dependent on drugs, and as such may be beholden to another who supplies them with those drugs, and in this episode Mumm-Ra wields that power with all the malevolence at his command. 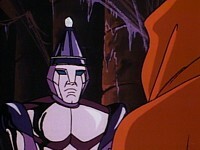 Perhaps the most disappointing aspect of this episode is the fact that, in spite of the title and despite his popularity and potential as a villain, the Driller himself actually plays only a minor role in this episode, which instead focuses on the ThunderCats’ attempts to safely return the substance known as Sponge Fog back to Cats’ Lair in order to prevent their home from being destroyed by the acid from Acid Lake. For reasons explored earlier, the basic principle of this is actually a brilliant and diabolical scheme by Mumm-Ra—and yet, somehow, when translated to screen in this episode it never quite works. Partly this is due to a reduced sense of threat. Whilst it is true that the ThunderCats face many perils in this episode, and many of these do actually feel quite tangible, virtually all of these pertain directly to the ThunderCats’ journey back to the Cats’ Lair with the Sponge Fog. At no point does Cats’ Lair itself really feel properly in danger, at least not when compared to an episode like “Return to Thundera” or even “Pumm-Ra”, where the Lair is infiltrated and as such the ThunderCats’ base feels vulnerable. Another factor is that Mumm-Ra’s plan is quite flawed. Initially he plans for the acid to destroy Cats’ Lair and the ThunderCats as one, with the ThunderCats present within Cats’ Lair at the time of its destruction Yet the devil priest makes no effort to contain the ThunderCats within the Lair itself. 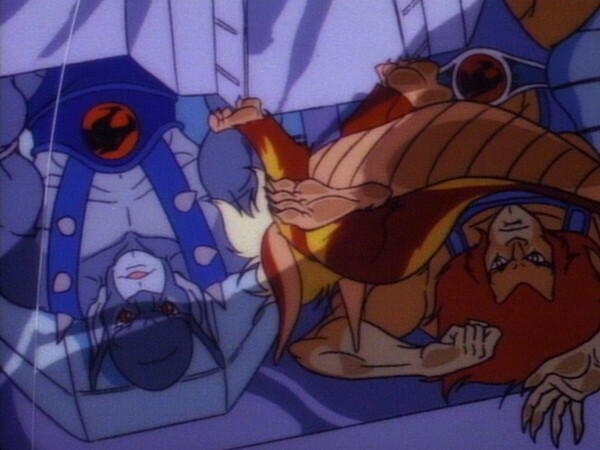 A short scene showing Mumm-Ra attempting to seal the ThunderCats inside, with our feline heroes utilizing their strength to break out and escape, would have enhanced the episode siginificantly. Another flaw in this episode is the anti-climatic conclusion. With the ThunderCats having gone through so many dangers to deliver the Sponge Fog to Cats’ Lair, in dramatic terms it would aid the episode greatly if the ThunderCats had to face their most deadly peril at the climax, perhaps with a ThunderCat having to climb out of the ThunderTank and position the Sponge Fog over the acid’s entry hole manually. Instead, when the ThunderCats arrive back at Cats Lair, the entire patching of the hole with the Sponge Fog takes what feels like just a few seconds, making the ending of this episode feel almost like an afterthought. Some of the action sequences themselves are entertainingly done, and it’s a particular treat to see the return of the Bridge of Light and the River of Despair, as previously seen in “The Time Capsule”. The scenes of the ThunderCats battling the giant insects are also very well done and at times quite creepy, showcasing that, however much the ThunderCats may learn about their new home world, Third Earth is a planet filled with natural dangers and hostile species, certainly not the easiest of places to try and build a new life! 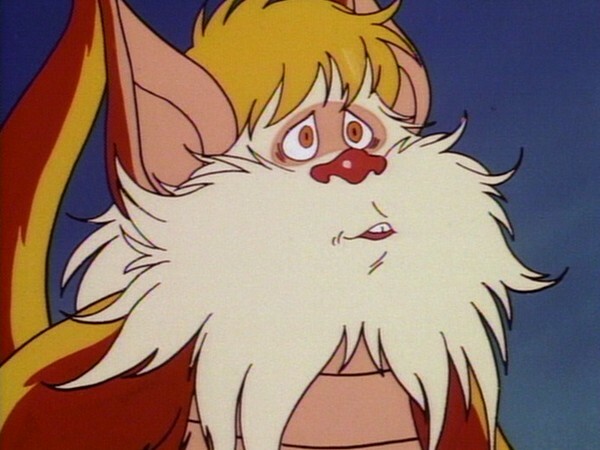 Howard Post also contributed the episode “Spitting Image” to the ThunderCats series, but sadly, where that episode was a masterpiece, this is more of a misfire. Nonetheless, there is one feature that both episodes share—the one redeeming feature that rescues this episode from mediocrity—and that is the obvious affinity that Howard Post has for writing for Mumm-Ra. 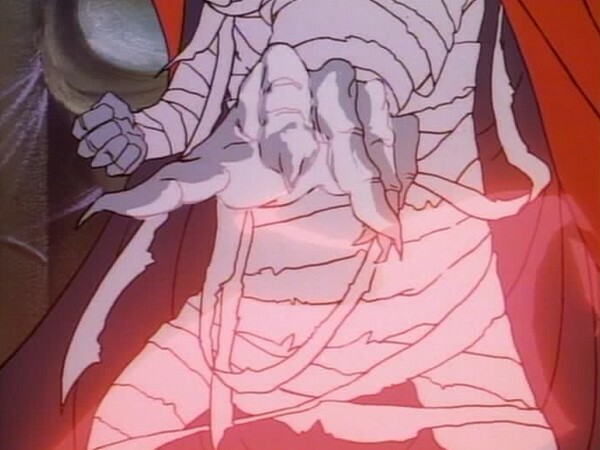 In this episode, Mumm-Ra positively oozes onscreen presence and drips evil. His dialogue is both eloquent and evocative, and makes a perfect marriage to voice actor Earl Hammond’s impassioned and powerful vocal performance, at times positively spitting the devil priest’s dialogue in a way that demands the audience’s attention. In total contrast to the rest of the plot, this episode marks one of Mumm-Ra’s finest outings to date, showing him manipulating events from afar and gleefully anticipating that ThunderCats’ downfall. Despite its shortcomings, this episode makes for worthwhile viewing purely for Mumm-Ra’s showstopping performance! “Return of the Driller” is an episode that promises much. Whilst it would be unfair to follow this with the traditional other half of that statement by saying that it “delivers very little”, it probably is fair to say that it delivers less than its title would suggest. 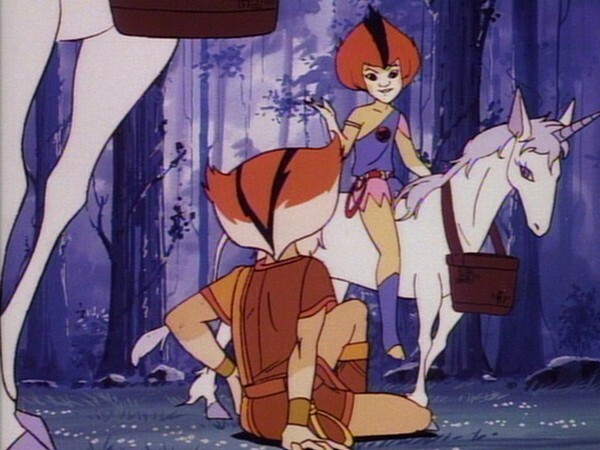 Although not without redeeming qualities, sadly this is one of the weakest episodes from the first half of ThunderCats’ Season One. 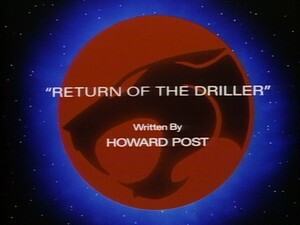 This is the second of two ThunderCats episodes to be written by Howard Post, the first being “Spitting Image”, which featured the Driller’s first appearance. Some of the footage of the Rock Men throwing boulders at the ThunderTank is very similar to a sequence of animation seen in the episode “Mechanical Plague”, in which the Rock Men’s target is Cheetara. 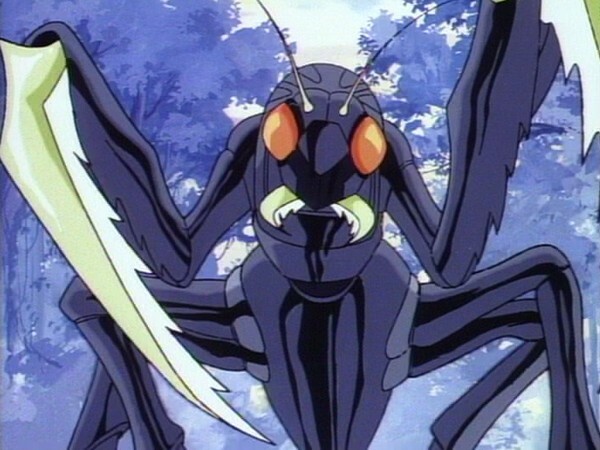 In this episode we are introduced to a creature known as the Mechanosect. 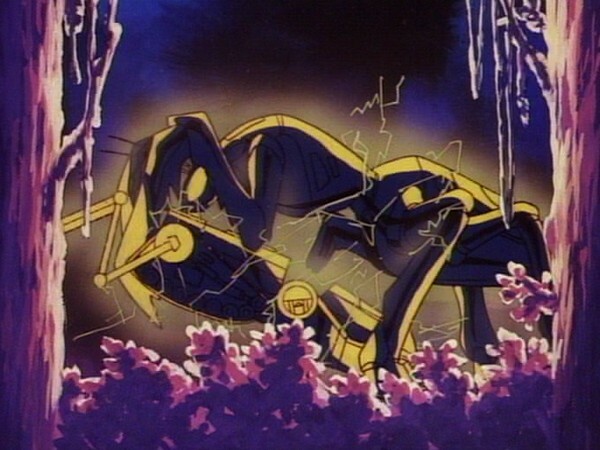 The Mechanosect would make a return appearance in the episode “Mechanical Plague”, alongside the Driller. However, in that episode, the Driller did not have a speaking role. 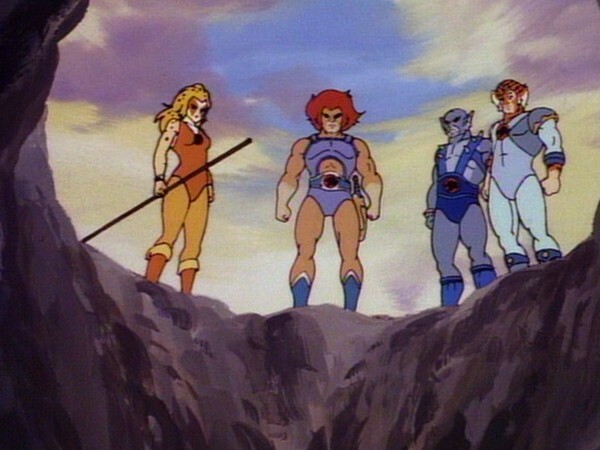 When Lion-O summons the other ThunderCats, the sequence of animation used when the Sword of Omens extends is a very rare variation on the usual sequence, showing the Sword’s blade extending at an angle. When Lion-O is being abducted by the giant insect and the ThunderCats make to free him, the brief sequence of animation focussing on Tygra’s bolo whip flicking through the air is taken from the show’s opening titles. Despite the title, the character of the Driller actually doesn’t appear after the first six minutes of this episode!